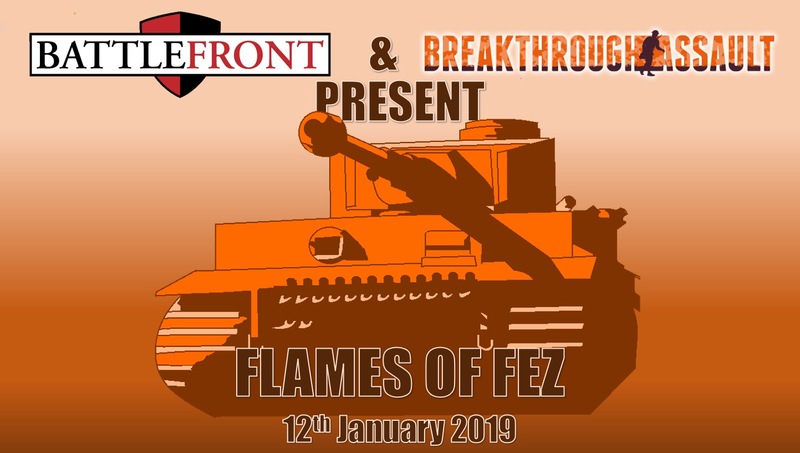 Flames of Fez is a one-day event hosted by Eddie ‘Fez’ Turner celebrating the Flames of War hobby and hosted at the Guildford Games Club on Saturday the 12th January 2019. The day will consist of 3 games of MW 96pts and armies can be drawn from any Mid War book. We want to try and encourage different styles of player and armies at each of our events and ‘Flames of Fez’ will try to promote fast, decisive game play – as such a hard time limit of 2 hours per game will be applied (this also ensures we can have a break between games and get home at a reasonable hour). Please consider your forces carefully regarding these game timings. Games will be Red vs Blue and missions will use the Battleplan selector method. Please note due to the shorter game period Rearguard may be re-rolled if either player wishes. We are also offering a challenge for those gamers brave enough, with the ‘Iron Fez competition’ – Bring three different armies for the same nation, and get told what one you are using each round at random (Perfect when you can’t decide what army you wish to play). All players who do this will be entered in a separate prize draw. There will be awards to mark achievements on the day including best generals, best painted and best army history, however the prize pool will be given out via a raffle – so all attendees will have a shot at winning something regardless how new you are to the game.